A hernia is a sac formed by the lining of the abdominal cavity (peritoneum). The sac comes through a hole or weak area in the fascia, the strong layer of the abdominal wall that surrounds the muscle. Femoral hernia appears as a bulge in the upper thigh, just below the groin. This type is more common in women than men. Hiatal hernia occurs in the upper part of the stomach. In this hernia, part of the upper stomach pushes into the chest. Umbilical hernia appears as a bulge around the belly button. It occurs when the muscle around the navel doesn’t close completely. Most often there are no symptoms. However, sometimes there may be discomfort or pain. The discomfort may be worse when you stand, strain, or lift heavy objects. In time, most people will complain about a growth that feels tender and is growing. Although a hernia may only cause mild discomfort, it may get bigger and strangulate. This means that the tissue is stuck inside the hole and its blood supply has been cut off. If this occurs, you will need urgent surgery doctor specialists. Laparoscopy Surgery is the only treatment that can permanently fix a hernia. Surgery may be more risky for patients with serious medical problems. If the hernia is small and not causing symptoms, your surgeon may just need to watch it to make sure it is not growing or causing problems. 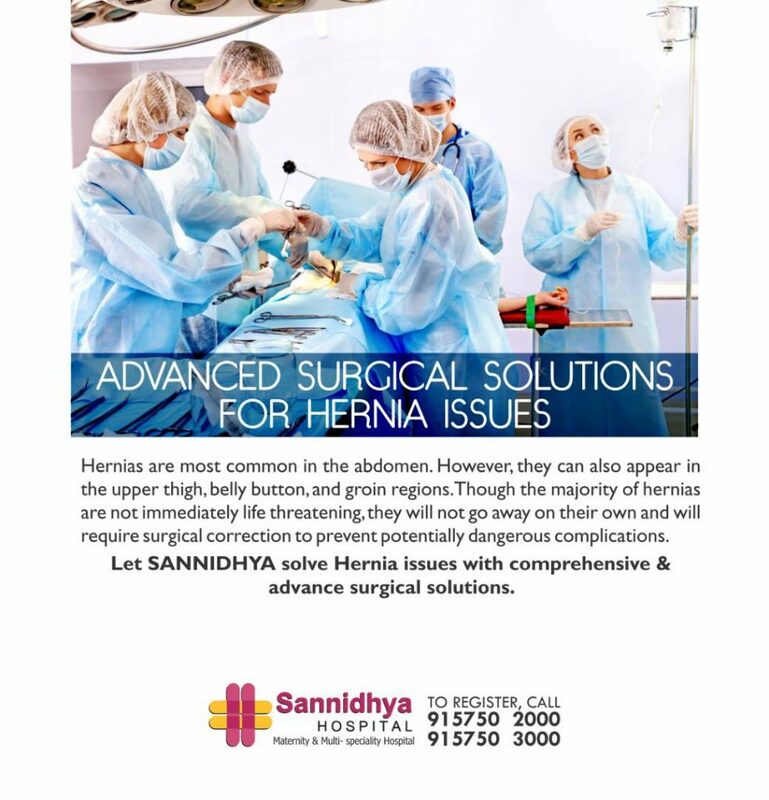 Sannidhya is equipped with the latest technology and infrastructure, supported by an expert surgeon and support staff. The department specialises in performing all major surgeries involving abdomen, skin, breast, soft tissues, and hernia. Laparoscopic surgery is also known as key-hole surgery or minimally invasive surgery. It is widely used in gynaecology, gastroenterology and urology. Patients receive specialised assessment, latest treatments along with clinical post-operative care, medications and a regular follow-up.